North Korea created the 'Pyongyang Time' timezone for itself in 2015 to commemorate the 70th anniversary of liberation from Japan. North Korea is moving its forward by half an hour to bring its timezone back into alignment with South Korea in the wake of the historic peace summit last week. The two countries have been half an hour out of sync since 2015, when Kim Jong Un's regime created their own timezone for the country that was 30 minutes behind. But Kim changed his mind at the peace summit on Friday. According to state media, he felt a "painful wrench" to see two clocks showing different times for the two Koreas at bilateral meetings. He reportedly added: "It is not an abstract meaning that the north and the south become one, but it is just a process in which the north and the south turn their different and separated things into the same and single ones." Kim and the South Korean President, Moon Jae-in met in the Korean Demilitarized Zone last week. They put on a show of unity and friendship, and promised to work toward denuclearisation and pursuing a peace treaty to end the Korean War. 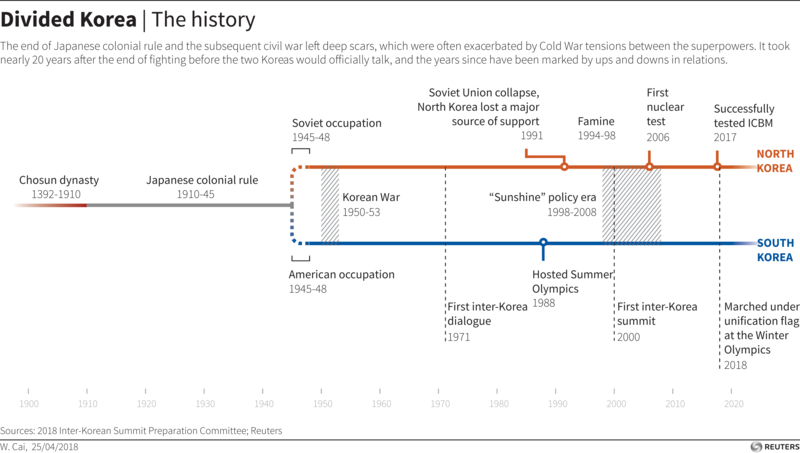 The Korean War, which started in 1950, is technically still happening. North Korea created a new time zone — named "Pyongyang Time" (PYT) — for itself in 2015 to mark the 70th anniversary of Korea's liberation from Japan. CNN quoted KCNA at the time: "The wicked Japanese imperialists committed such unpardonable crimes as depriving Korea of even its standard time while mercilessly trampling down its land with 5,000-year-long history and culture and pursuing the unheard-of policy of obliterating the Korean nation." South made gestures of reconciliation as well in light of the summit. The South Korean military committed to removing loudspeakers that blare propaganda at the Demilitarized Zone (DMZ) across the North Korean border. The loudspeakers, operated by the military's psychological warfare unit, previously dealt with politically sensitive topics, such as a North Korean soldier's defection to the South, news of the South Korean national soccer team's World Cup success, as well as playing and K-pop songs. A North Korean defector in 2017 said he became "enamoured" with the South from listening to the loudspeakers. What’s behind South Korea’s elderly crime wave? 2018 was an historic year for the Korean Peninsula, but what lies ahead? Is this the dawn of a nuclear-free Korean peninsula?